When I was at my previous church, I officiated at a lot of funerals. At that church on All Saints Sunday, we lit candles on the altar for each member who had died in the previous year. On my first All Saints Sunday there, we had eight candles on the altar. I had done seven of the funerals. By the time I left, I had done nearly three dozen. That’s a lot of funerals. The words are not much different from the actual Scripture passage in the New Revised Standard Version which I ordinarily preach from. But there is a difference in verse 2 that jumped out at me as I reflected on this passage. John’s letter reads “Beloved, we are God’s children now.” The funeral service uses the words “dear friends” instead of the word “beloved.” Both “beloved” and “dear friends” are accurate translations of the Greek word John used. “Dear friends” is used in many other Bible versions, including very good ones like the New International Version and the Common English Bible. But there’s something about that word “beloved” that conveys so much more. John’s Greek word has the same root as the word agape—that kind of love which has only the best interests of the loved one in mind. Agape is a selfless love. It is the love given simply because the other is precious to us, with no thought for what they might be able to do or give in return. In our passage, John uses the word “beloved” to describe the members of the church he is writing to. “Beloved” expresses the feeling he has toward them. But, it also names them as the ones God loves. As we place ourselves alongside those ancient Christians and hear John’s words as they speak to us, we also hear ourselves named as God’s beloved. God looks at us and calls us “beloved,” along with all those in every age who have believed in Jesus and with all those believers yet to come. We are the recipients of God’s agape love, a love that has only our best interests at heart, a love that is freely offered, simply because it is God’s nature to freely love. This love makes us God’s children now—not at some time in the future, not after we die, not when Christ comes again, but now. To get an idea of what it means to be God’s “beloved,” we have only to look to scripture. 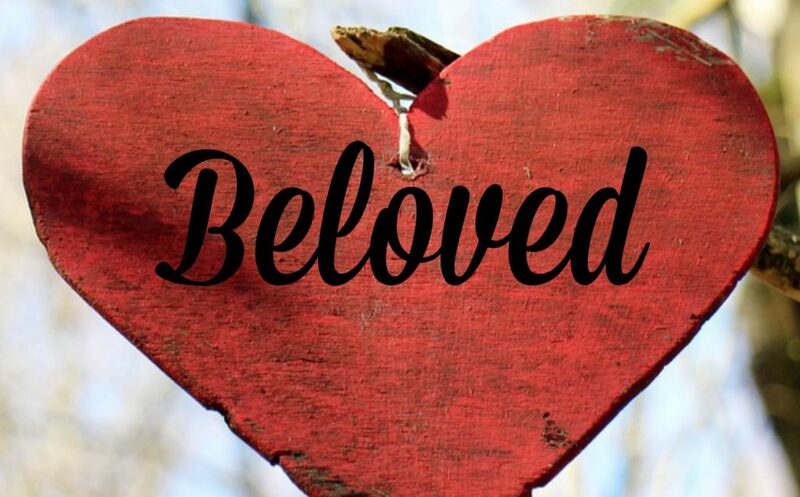 The word “beloved” is used most often in the Song of Songs, which we often call the Song of Solomon. The Song of Songs is a passionate, no-holds-barred love poem. That is the kind of passion God has for us. Daniel, rescued from the lion’s den and fiery furnace, was called “beloved.” The nation of Israel was called “beloved.” God called Jesus, in the Jordan and on the mountaintop, “beloved.” And we—no matter who we are, or where we are, or what we are, are invited to take our place among God’s beloved. But even as we hear that we are God’s beloved now, it is hard to accept. The world seems to value us only for what it wants to take from us—our money, our time, our abilities, our loyalty, sometimes even our integrity. It is hard to believe that we are so deeply and unselfishly desired that God calls us beloved. The world tells us we are insignificant and expendable—interchangeable cogs in the machinery of the world—so it is hard to believe that in our belovedness, and that each of us is a unique, precious, irreplaceable child in God’s family. First, he says, we must accept that we have been “taken,” or he suggests, “chosen.” God has taken, or chosen, each of us to be loved as the unique individuals that we are. Psalm 139 reminds us that God knows us even when we are “being made in secret, intricately woven in the depths of the earth.” God looks at us, chooses us, and takes us as God’s own. This idea of chosenness might make us a little nervous. We may fear that if we are chosen, someone else may be left out. But our chosenness doesn’t exclude others. Each person is of sacred worth, and God is prepared to take each one who says yes to being taken. Finally, in our belovedness, we are called to be given. The joy we experience in our belovedness is something we just cannot keep to ourselves. We want others to share in it, too. We want to give others the knowledge that they, too, are chosen by God to be among the beloved. We want to be a blessing to others—to let them know that they are precious and wanted and loved. We want to give others the reassurance that their brokenness does not disqualify them as children of God—that even in their brokenness they, like us, can find the blessing that comes with being God’s beloved. We can give ourselves, even in death. Our society tries to distract us from the inevitability of death. It offers us anti-aging creams, Disneyworld vacations for senior citizens, and silver-haired men dripping with beautiful young women as they sell their brand of beer. But death is inevitable, and we can live our lives now so that when we die, what we did in life will be multiplied after we are gone. We can live out our belovedness now so that in our deaths, others might more fully experience their own belovedness. Taken, blessed, broken, given: the words of our Communion liturgy sum up the life of the Beloved. They also sum up the life of a saint in the Wesleyan tradition. For United Methodists, “saints” are people who exemplify the Christian life and what it means to be the Beloved of God. They include the apostles and other early followers of Jesus, of course. But, we also recognize all Christians of every time and place who lived faithfully and shared their faith with us. Saints are those whose lives have been transformed by and reflect the holiness of our Triune God. On this All Saints Sunday, we remember all those who have been saints to us. In accepting and living out our belovedness, it is possible for each one of us to be counted a saint. We can be the ones who live secure in the knowledge that we are God’s beloved. We can celebrate the uniqueness for which God has chosen and taken us, and help others to know their own chosenness. We can daily sharpen our awareness of and gratitude for the blessings that come our way, and we can be quick to bless others. We can face our own brokenness without fear of defeat, and our confidence can strengthen others. We can give ourselves, in life and in how we prepare for death, expecting that the seeds we sow in this life will multiply when we leave it. This is the life to which God’s beloved are called, and it is the life we are invited to share. Amen.